Double-hung windows might be the most common style of home window and is so named because it has an upper and lower sash. One or both sashes can be moved up and down in separate grooves in the side jambs; the vertical pieces at the edges of the window frame. The top or bottom half of the window can be open at a time, making them a more versatile option than single-hung windows. Each sash consist of framework of stiles, rails, and mullions, horizontal and vertical wooden slats, in which panes of glass, sometimes called lights or lites, are set. Some companies provide pre-assembled dividers that snap in place over a single light, dividing it into six or eight lights, facilitating painting and other maintenance. Sashes are normally 1 3/8 inches thick. 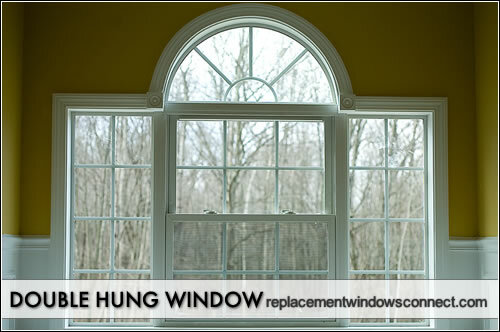 Double-hung widows include balance springs that counterbalance the sliding sash to hold it in place at the desired spot. Compression weather-stripping seals off drafts and acts as a counterweight and some varieties allow the sashes to be removed for easy painting or repair. The jambs are made of one-inch lumber to accommodate drywall or plaster, while the sills are 2-inch lumber and slightly sloped at about a 20-degree angle for good drainage. Hardware for these windows often includes the sash lifts or handles that are fastened to the bottom rail if there is no finger groove in the rail. Sash locks or fasteners are installed on the meeting rail, which is the part of the window where the two sets of panes meet and overlap. They not only lock the window but also draw the sash together to provide a tight seal. To install double-hung windows, fully assembled frames are placed in the rough opening that is lined with strips of building paper to minimize draft. The frame is then leveled and nailed, using corrosion-resistant nails if they are exposed, to side studs and header through the casings or the blind stops, the frame pieces located between the jamb and the casing forming a ridge that supports either a storm sash or screen, at the sides. While the primary purpose of replacement windows is to allow the entry of light and air, they may also influence the architectural design of a building. For example, window replacements with the top and bottom sash divided into two horizontal lights nicely complement a ranch-type house. On the other hand, the windows in a colonial or Cape Code house quite often have each sash divided into six or eight lights.